Looking for trivia books filled with fun facts and trivia questions and answers? Answers to Questions You've Never Asked will entertain you for hours Fun facts for kids of all ages: When you take the most absurd parts of history, science, economics and geography, you end up with a pretty confusing picture of humanity. Why do we have borders, what's the furthest you can get from the ocean, how do you qualify as a country and why did Vikings wear those silly helmets? These are just a few of the strange questions that bounce around the head of YouTube sensation Joseph Pisenti, aka Real Life Lore. Trivia questions and answers: In his channel, Pisenti presents illogical truths in a logical manner. In his debut book, Pisenti builds on this nonsensical humor of the universe with in-depth analysis of empires, economies, and ecosystems as he helps answer the ridiculous. Why, you ask? Because someone has to. Using line drawings, graphs and charts, Pisenti not only details the absurd, but he also provides explanations on why things are...and why they aren't. Answers to: - Where can I move to so that I'm never tempted by McDonalds again? - How far into the Pacific does Trump's wall stretch? - If Plato came back to life, what would he think of modern democracy? - Why do all empires fail? - Who decides what countries are allowed to participate in the Olympics? - What makes Finland so great? 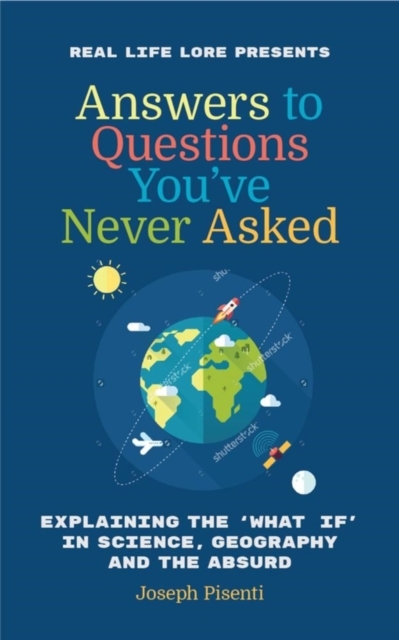 Witty, thought-provoking and occasionally snarky, Answers to Questions You've Never Asked is for anyone who beams with curiosity and has a belly-button.